We're here and then we aren't. The transition to non-being can happen with ridiculous suddenness, and for no good reason. It can happen to young people in good health, people who seem as vividly alive on the web after their physical being has ended as they did before it. Someone who should be reading this page isn't. Someone who should be updating us with fresh information about his life never will again. Jip de Kort went to sleep on Sunday evening and never woke up. His heart, apparently, just stopped. He was 37 years old. I learned about this when I was in London. His friends tell me he felt no pain. Jip's Facebook page announced on Saturday "I'm starting a trip to Sprang-Capelle today". At 1.06am on Sunday evening his status feed announced "Jip is returning to Utrecht today". He died a few hours later. 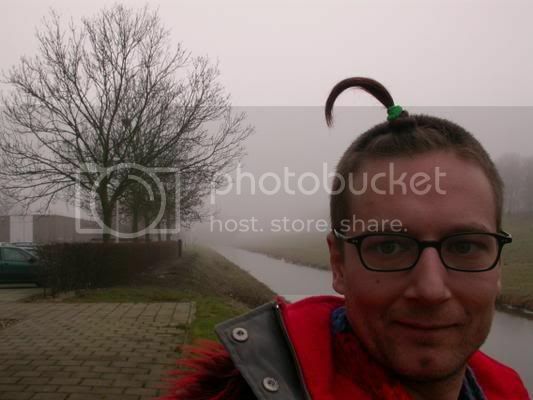 I'm not sure whether it happened in Sprang-Capelle or his home town of Utrecht. 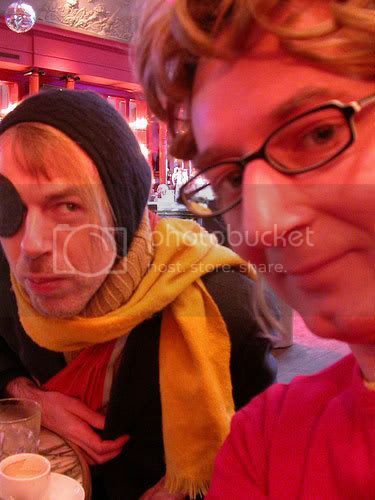 Jip -- one of the staunchest Momus fans, and one of the gentlest people I've met -- was a self-mediator. On his Flickr page and on his Kwark page Jip posted photos of his life. We shared something that I recognized when I started looking at his photos in 2003, something to do with the gently obsessive need to record the world in digital form, and record himself too. Jip was the perfect model of the digital dandy, someone who endlessly recorded not just his travels and his experiences moving through the world with his girlfriend Stef Swaczyna, but also experiments with his appearance. He photographed his ever-changing clothes and hair with something that wasn't as much narcissism as a gentle wonder, amused and bemused. 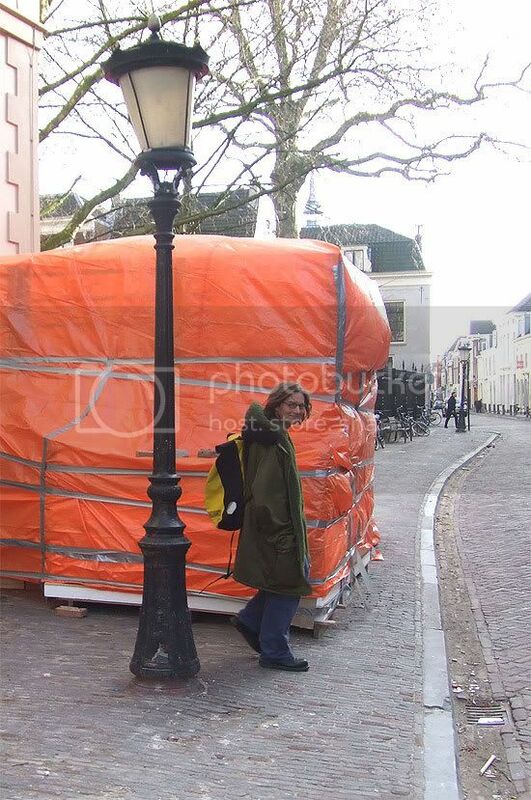 "Dutchman Jip de Kort likes coloured plastic, art galleries, fire extinguishers, and trains. The plastic bottles in his bathroom are arranged according to colour, like a Tony Cragg installation. Jip clearly lives to photograph. He does it with an eclectic, sensual abandon, and as a result I feel like, first, an initiate and, later, an intimate in his world. I understand his love of plastic, his affection for the future, his gentleness and the harmonious, hedonistic pacifism of his life. Oh, the words are so much uglier than the images – ‘hedonistic pacifism’, indeed! The photos train me to see as Jip sees, to recognize his holy holies, his habits, his fetishes, his wounds." Jip picked up "hedonistic pacifism" for the Religion slot on his Facebook page. He must have liked the phrase, or been amused-bemused by it. When I think of Jip -- and we met less than ten times in total -- I think of the deep, gentle, calm, benign energy that radiated from him. That concern for the human application of digital technology goes right to the heart of what Jip was all about: making humane things with technology. Teaching code to help us live. I wasn't able to attend Jip's funeral, which happened on Friday in Utrecht. Asked to choose one of my own songs for the ceremony, I selected Rhetoric from my Timelord album, a song about the endlessness of love. I will return to Utrecht and play a memorial concert for Jip soon, at Kikker Theatre. But I'd encourage you to look at his photos on Flickr and on Qwark. They're not just documents of a life well-lived and well-valued, the sweet and precious and simple and complex and sensual life that Jip lived, they're now a very poignant reminder to all of us that we won't always be here. Three weeks before he died, Jip bought a new digital camera, a Nikon Coolpix P6000. There are millions of Jip-pleasures and Jip-experiences that should have been recorded to the P6000's CCD array that now never will be. In Mika Taanila's documentary about tech-utopian artist Erkki Kurenniemi, The Future Is Not What It Used To Be, Erkki explains why he takes so many photos of his life. He believes that an advanced civilisation of the future will collect the digital traces we're leaving now and re-assemble cybernetically the lives and personalities of those of us who documented everything. If Erkki is right, Jip will live again, with all the textural richness he experienced the first time around. In the meantime, Jip will be -- for those of us who knew him and were touched by his work -- not just a much-missed and dear friend, but a principle, an object lesson in how to value and record life. Oh God that is so freaky. I didn't really get to talk to him much at the gig but he was really nice to me. DD's on tribute gig? I'd love to come. Condoleances aan iedereen die hem kende die dit ziet. 37 is a patently unsuitable age to die. It's the age when the foibles of youth give way to the appreciation of Life to the fullest. However, from your description, it seems like Jip had already mastered the art of savoring every drop of Joy he could squeeze from a rich, art-filled Life. In this, he was a teacher for everyone and we would do well to follow his example. Sometimes, I think all of my science and objective reasoning taints the taste of my own life with too much metallic logicalness. I'll remember Jip's masterful example of how to fight that and embrace the Enlightened. I never knew him, but I know what kind of man he was and I am humbled to say that he is a wise teacher, indeed. Rest in the Peace you deserve, Jip. A moving and thoughtful tribute to your friend and to a life well lived. He seems to have lived a life rich with experience even if short. It's a shame about Jip, but it's good to see how significantly your fans and digital compatriots effect your life at times, and worthy of you to honor them and their friendship, support, and influence to you. It seems to me that with so much of an electronically wired community out there, and with just so much media, that otherwise significant people and their former lives are increasingly becoming a kind of digital ephemera after they die, with long, rarely reviewed trails of living behind them, gradually eroding, with elements saved somewhere, perhaps on archive.org or old usenet archives somewhere. One of the things I always wanted for LiveJournal back when it wasn't owned by yet another dotcom was for the content to be permanent... but as much as I think it's important, and even affordable due to the decreasing cost of storage, I now have doubts whether it will actually happen that way or not. I hope so, as there are already a lot of good people no longer there, including several good online friends. Part of me thinks / fears that the future will look at this moment in time, this era of radical openness on the internet, as a dying fad, like tinkerers in wireless, and that the future of the internet is increasingly "friends only", locked away where nobody will have to face the dangers of actually getting to know people online. I think the ultimate recording medium is the souls of the people around; that's where things are made permanent, if they are. I do back up Click Opera, for instance, but there isn't another destination for it than the hearts and minds of the people who read it here. And Jip lives on in the recording medium of our hearts, minds, souls, memories too. "I think the ultimate recording medium is the souls of the people around; that's where things are made permanent, if they are." True. I probably think too much about the medium, and how to make it more human-friendly, because, well... that's who I am... but ultimately it depends upon people's willingness to pour their humanity out there, in a generous, open manner. And yet, I get older, and the world seems ever more balkanized, and yet strangely with less "there" there. That, of course, could just be my perception of it all. And I'm left feeling like a spectator, appreciating the awful beauty of it all, behind a thick dome of plexiglass. Connections are what you make of them, and its admirable that yours are so close and vital, in a world which oftentimes seems increasingly diffuse and abstract. I like him a lot. I wish I'd known about him sooner. Everything I write seems wrong, but this came on as I was browsing his photographs, and it was magically right. See you in the next life Jip. Peace to your friends and family. If there is no Click Opera in heaven... I don't want to go. That was a beautiful eulogy. Thank you for introducing Jip to those who never will meet him in this place.